Our Abt-Stube offers guests a venue with a very special flair. A perfect location for festivities such as birthdays or family celebrations for up to 40 persons. These three abbots of the Premonstratensian Monastery in Bad Schussenried are directly connected with our country inn. 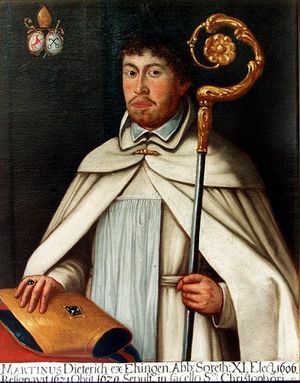 Abbot Dieterich Abbot Martinus Dieterich from Ehingen was the 11th abbot of the Premonstratensian Monastery in Bad Schussenried; term of office was from 1606 to 1621. In 1606, abbot Dieterich rebuilt the “Würths-Haus in Steinhausen” with remaining remnants of a castle and the Fronhof of the local nobility (donation is documentary mentioned) and roofed with clay tiles. St. Ivo (Ivonus) was determined patron saint of the house. On 2nd September 1610, Hans Henlin was mentioned as first tenant. 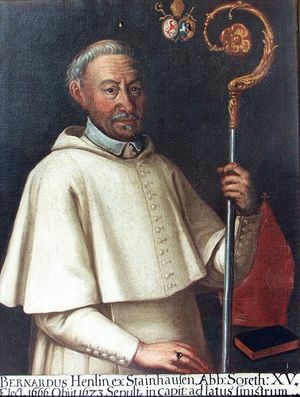 Hans Henlin was the father of the 15th abbot Bernardus Henlin. Abbot Ströbele Abbot Didacus Ströbele from Biberach was the 19th abbot of the Premonstratensian Monastery in Bad Schussenried; term of office was from 1719 to 1733. As the chronicle says, he was elected abbot with only 32 years – balking and in tears. Upon the recommendation of the abbess from the monestary in Sießen, he instructed the Zimmermann brothers to build the late-baroque pilgrimage church in Steinhausen from 1727 to 1733. In 1716 already he had build the chapel in Wattenweiler and in 1725 the churches in Eggatsweiler, Eggmansried and Attenweiler. During a surprising visitation of the vicar general, abbet Vogler from Rot an der Rot, abbot Ströbele was deposed. The protocol however does not mention the reasons. One of the reasons put forward is that he may have incurred high debts for the monastery when constructing the pilgrimage church (43,000 guilders). In addition, the annals also mention that his character was not well-grounded and that he lived a too relaxed life. With the banishing of Didacus Ströbele to the monestary “Allerheiligen” in the Black Forest where he died in 1748, he has been disproportionately disciplined. This cannot be solely due to the high construction costs as his successor has done business even more generously. There was nothing known about any economic woes. Abbot Henlin Abbot Bernadus Henlin from Steinhausen was the 15th abbot of the Premonstratensian Monastery in Bad Schussenried. He was born in the Landgasthof zur Linde. 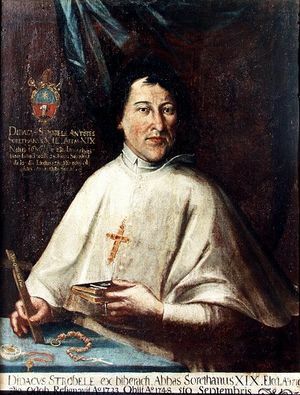 Bernardus Henlin was elected 15th abbey on 5th July 1666. His term of office lasted until 1673. Henlin, who actually was a military chaplain, was fluent in French, Italian and Spanish. In the Abt-Stube you can see the three abbots on larger pictures. The Heinzelmann family would be pleased to provide you more detailed information on the abbots.